"Revenues and gross profit generated by our retail franchise operation in the Cayman Islands improved slightly from prior-year levels during the most recent quarter, primarily due to a modest inflation-related base rate adjustment in the first quarter of 2011 along with higher energy pass-through charges," McTaggart stated. We take comfort in our financial condition, especially during this time of global economic uncertainty that has disrupted equity markets worldwide in recent weeks. Our operating activities generated net cash of approximately $24.8 million over the last three fiscal years and an additional $7.9 million during the first half of 2011. On July 31, 2011, we paid our third quarterly cash dividend this year of $0.075 per share to our shareholders. Our most recent cash dividend equates to an annualized yield of approximately 3.8%, based on our closing stock price on August 8, 2011," he added. I have learned my lesson: I no longer bother trying to advise IDIOTS…. "BEST course of action: DON'T RENEW CWCO's license and buy their assets at book valuation – or some $30 million at my last estimate – and float the combined company on NASDAQ when the time is RIPE…"
You think a forced government takeover of a business is a good idea? What complete nonsense. First, didn't you hear that govt. has no money to buy anything which is why it was seeking to sell or lease the WAC in the first place? Second, if it did have the money and bought out CWC it would no longer receive any licence fees. Instead, you find that there is an equalisation of rates between former CWC customers and WAC such that WAC customers rate would have to be raised. Compulsory acquisition by the govt. of a commercial enterprise is not an ordinary business risk. Well done shareholders of CWCo!! Not too many can say they "profited" during the wosrt recession Cayman has known. Utilities shareholders, gas station shareholders, politicians, and supermarket shareholders will be the only millionaires left standing the day before the 2013 election. After the 2013 election there will be nationalisation of these types of businesses. The CWCO stock price is now around US$8.56, down from around US$32 in 2008. CUC stock price is around US$9.40, down from around US$15 (I recall) in 2008. CUC dividend yield is more than double that of CWCO. What is this telling us. Is it telling us that CWCO stock is overpriced? The growth is gone, as in no new contracts anywhere on the horizon, so it can only be the cash horde that keeps it trading at a PE similar to Apple and other growth stocks. In reality it should be trading between $5 and $6 based on a PE similar to GE, J&J, Proctor & Gamble etc. I'm no market guru, but a stock is supposedly priced on its future potential. Sooner or later everyone is going to realise that there is no more growth and the stock price will plummet further. Even if the government renews their license with terms that will allow them to continue with the exhorbitant returns they now get from their franchise area, they need to start winning a few contracts or the stock is going to collapse. I wouldn't hold out any hope for the Mexico project. Wow, they sure are screwing their customers. The Water Authority charges 0.01518 per gallon. By my calculations Cayman Water Company is charging 21.6% more for their water, assuming that the meter rental and EAF is the same for both companies. Our service area is comprised of an area on Grand Cayman that includes the Seven Mile Beach and West Bay areas, two of the three most populated areas in the Cayman Islands. For the three months ended June 30, 2011 and 2010, we generated approximately 44% and 48%, respectively, of our consolidated revenues and approximately 53% and 56%, respectively, of our consolidated gross profits from the retail water operations conducted pursuant to our exclusive license. Their retail customers in Cayman account for only 44% of their total revenue, but they make up 53% of their gross profits. The Cayman operations is the cash cow that supports the rest of their overseas projects and big bonuses for their staff. Obviously they must love the UDP government which allows them to raise the rates on their customers at the same time they are supposed to be negotiating a new rate structure. I wonder if any of the churches in West Bay get free water? The Water Authority's rates are being subsidised by the licence fees from CWC. They do not reflect the actual cost of producing the water. So the lower rates for WAC customers is indirectly due to CWC. If you believe that voters in West Bay pay 20% more for their water to subsidise voters in East End and North Side then you don't have a very good grasp of how Nation Building works. lol. I think you are forgetting that the licence was not put in place by McKeeva's govt. CWCo does not pay a license fee for nothing. WAC earns the license fee paid to it by CWCo by ensuring that the private (i.e. 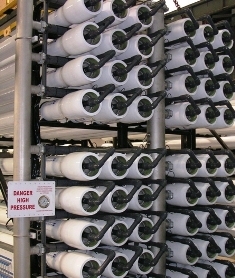 non-government owned) CWCo maintains a high quality standard of water for its customers. Huh? No one was disputing that the licence fees are not required to be paid or that it is not right for WAC to receive them. The point was that it is unfair to compare the water rates of the two organisations given that WAC's rates do not reflect the true cost and it can only do so because it has another source of income, namely licence fees paid by CWC. So what is the price of water in Grand Cayman now? Probably at least twice what should be.